Following violent attacks on their homes, displaced indigenous people of the Chittagong Hill Tracts have returned home with government guarantees for their safety and compensation for their losses. Some indigenous people, who had fled their homes in Matiranga on Saturday [3 August 2013] to escape communal attacks, returned home from Indian bordering areas on Sunday. They came following assurances from State Minister for Chittagong Hill Tracts (CHT) Affairs Dipankar Talukdar that they will be provided with security and rehabilitation. “All of them returned home by 9:00pm on Sunday. Many of them have taken shelter on the premises of a primary school,” Masud Karim, deputy commissioner of Khagrachhari, told The Daily Star yesterday. Meanwhile, protesting the attacks, United Peoples’ Democratic Front (UPDF) enforced a dawn-to-dusk road blockade in the district yesterday. 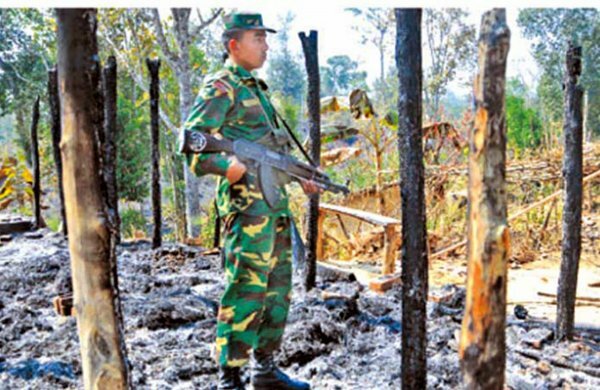 Over 1,500 indigenous people, mainly Chakma, Tripura, and Marma, fled to the bordering areas on Saturday after agitated Bangalee settlers torched and vandalised 30 houses of hill people and three houses of Bangalee settlers in five villages in Matiranga upazila, said Imdadul Haque, Guimara sector commander of Border Guard Bangladesh (BGB). The villages are Bagapara, Bandarsingh, Manudash Para, Sarbassha Para, and Talukder Para under Taindong union of the upazila. Two temples were also vandalised during the attack, according to locals. Police said the attacks were launched after some indigenous men had abducted motorcyclist Abul Kalam on Saturday morning. Hours later, he was found in Komangpara of Taindong union. On Sunday, a team led by Dipankar Talukdar met the hill people at the BGB’s border outposts (BOP) of Taindong and Fenichhara around 1:30pm, and assured them of security and rehabilitation. Masud Karim said the district administration had provided 30 kg of rice and Tk7,500 for each of the families who lost their homes. The government will also rebuild their houses, he added. A case was filed against 175 people, including 30 named, with Matiranga Police Station in this connection yesterday. Police arrested four people for their alleged involvement in the attacks. During the road blockade by the UPDF yesterday, pickets vandalised at least 10 vehicles at different areas in Ramgarh and Khagrachhari Sadar upazilas. All kinds of transport stayed off the streets, causing sufferings to commuters, said witnesses. Our Rangamati correspondent adds: Parbatya Chattagram Jana Sanghati Samity (PCJSS) formed a human chain before the New Court Building in the town yesterday protesting the attacks on indigenous people. Besides, the Indian English daily The Hindu yesterday reported that the exodus of the hill people had caused concern for the Tripura government, which had several deliberations with the Indian central home ministry on Saturday evening. In a press release yesterday, Binoy Kumar Chakma, press and information secretary of the PCJSS, blamed the UPDF for the attacks. Contacted, Niron Chakma, press and information secretary of the UPDF, denied the allegation.